This article contains facts and information about the life and times of the famous Native American Indian chief known as Victorio. Who was Victorio and why was this Native Indian chief famous? Summary: Vittorio (c.1825 – 1880) was a famous chief of the Apache tribe. He was a leading figure in the resistance to white settlement on Apache tribal lands. He was eventually caught by Mexican soldiers at Tres Castillos in the state of Chihuahua in Mexico. Victorio and his band all died and the Mexicans took their scalps to claim their bounties. The following fact sheet contains interesting facts, background history and information about the life of Victorio and the events in history that led to his fame as a great Native American Indian leader. Victorio was born in the Chihenne tribe of the Apache Indians. He lived and grew up in Warm Springs, before foreigners invaded their land. He rose to warrior chief status as a military strategist by leading small groups of warriors, often consisting of no more than 35 to 50 fighters, in triumphant resistance to Mexican and American troops. He also possessed the skills in diplomacy and was able to talk in a sincere and soft-spoken manner when dealing with foreigners. The battles that Victorio fought were as much spiritual in nature as personal. According to him, Warm Springs, his hometown, was bestowed upon by Ussen, the Apache Tribes god of cosmology. His homeland was first encroached by the Mexicans and then, in 1850, Americans also started to invade Apache territory. This action prompted the start of the Apache Wars (1850 - 1900) which were fought by other famous Apache chiefs such as Cochise and Geronimo. His tribe was first united in 1837 by Mangas Coloradas, aka Chief Red Sleeve, near the Gila River in south-western New Mexico. In 1862 the murder of Chief Red Sleeve and the mutilation of his body only increased the hostility between Apache and the United States. Victorio was the next in line to adopt the role of Apache war chief. Victorio gathered together a band of about 300 Eastern Chiricahuas and Mescaleros and his band of Native American Indians settled near Fort Craig, New Mexico. In 1869 they happily moved to a new reservation near Ojo Caliente (Warm Springs), New Mexico where they established farms and enjoyed a pleasant way of life. Their lives changed for the worse when in April 1877 it was decided by the US government to take the reservation lands, and that Victorio's Apaches were to be moved to the San Carlos Reservation in Arizona. Victorio argued the cause of his tribe with great eloquence but was unable to change the decision. Fearing violent reprisals his band of warriors, women and children had no alternative but to go to the reservation. Victorio refused live in the terrible conditions on the Arizona reservation and he and a small band of less than 50 warriors became fugitives and started raids over a massive area spanning New Mexico, Texas, and Mexico. The series of conflicts became known as Victorio's War (1879–1880). The band was difficult to capture as they moved around so much and did not have a permanent base. Evading capture they won a significant victory at Las Animas Canyon on September 18, 1879. Fear of the Apache increased with the incident called the Alma Massacre on April 28, 1880 in which Victorio's band of Chiricahua Apaches raided American settlers' homes around Alma, New Mexico Territory. Over 40 people were killed in the raid. They were eventually driven off by Americans in Fort Bayard, but continued their conquest in Fort Tulurosa. Eventually, Victorio and his Apache band met their demise on October 14, 1880 when they were surrounded at Tres Castillos in the state of Chihuahua in Mexico by the Mexican Army under Colonel Joaquin Terrazas. Victorio and his band all died and the Mexicans took their scalps to claim their bounties. Mexican officer Mauricio Corredor claimed to have killed the Apache chief. 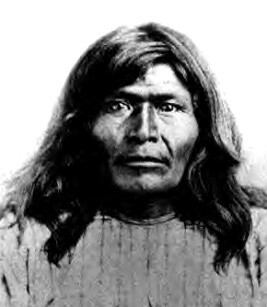 So ended the life of the legendary Apache chief Victorio. Discover the vast selection of pictures on the subject of the tribes of Famous Native Americans such as Victorio. The pictures show the clothing, war paint, weapons and decorations of various Native Indian tribes, such as the Apache tribe of Victorio, that can be used as a really useful educational resource for kids and children of all ages studying famous Native Americans such as Victorio. We hope you enjoy watching the video - just click and play - a great educational resource for kids.